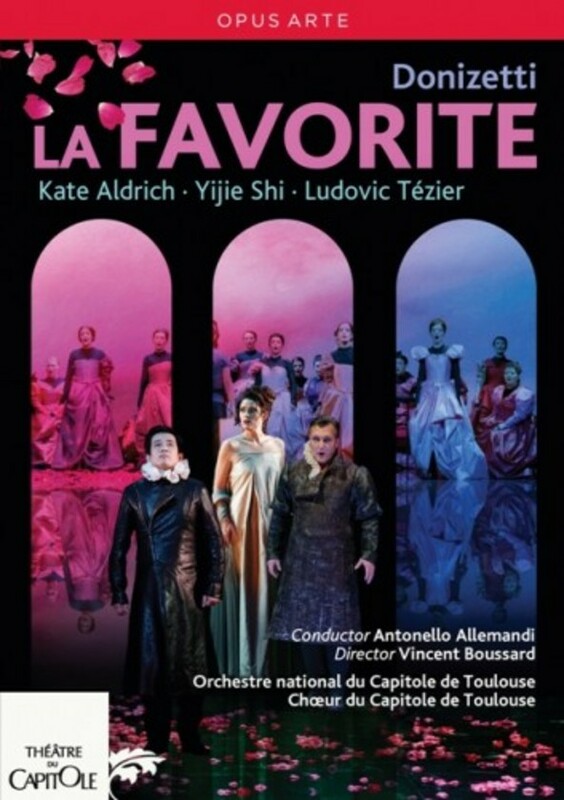 One of the composer's most beguiling scores, La Favorite is Donizetti's La favorita in its original French form - a tale of love and war that represents a glorious mix of Italian bel canto and 19th century grand opera. Today's scholarly interest in Donizetti's output has helped bring La Favorite back into circulation, and Vincent Boussard's arresting Toulouse production does full justice to its renewed masterpiece status, accentuating the work's intimacy through economical sets and Christian Lacroix's striking costumes, thus drawing attention to the opera's three main characters. Three international principals take on these demanding roles: Chinese tenor Yijie Shi is a 'revelation' (La Depeche) as Fernand, with French baritone Ludovic Tezier offering suitably rich-toned authority as King Alphonse XI and lauded American mezzo Kate Aldrich - 'the Carmen of this generation' (San Francisco Sentinel) - plumbing the emotional depths of Leonor's music. Conductor and bel canto specialist Antonello Allemandi derives every possible nuance form the score, adding to the passionate proceedings on stage. Recorded live at Theatre du Capitole de Toulouse, February 2014.